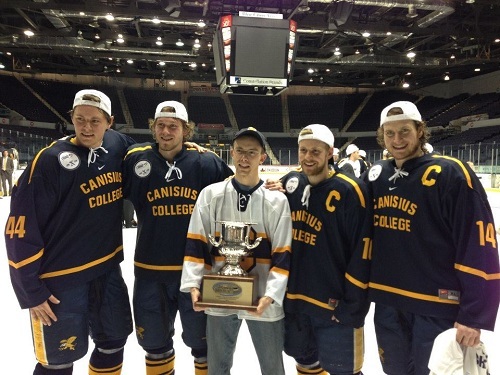 I couldn’t be any more prouder of the Canisius College hockey team. As an alum of the school and frequent attendee of games (all home and some away) it was great to see this program succeed. I have spent many nights cheering on the Griffs and keeping tabs on guys who have moved on to continue their careers. (Cory Conacher, Andrew Loewen, Kyle Bushee, to name a few). Coach Dave Smith should be congratulated for a job well-done. The Griffs had to sweep their last series of the regular season to host a first round playoff series. The task was difficult because it would involve beating the RIT Tigers. Canisius had never swept a series from them but were able to beat them 6-5 and 4-2. Canisius would host Bentley in the 1st round and would be seeded 7th in the Atlantic Hockey Tournament. 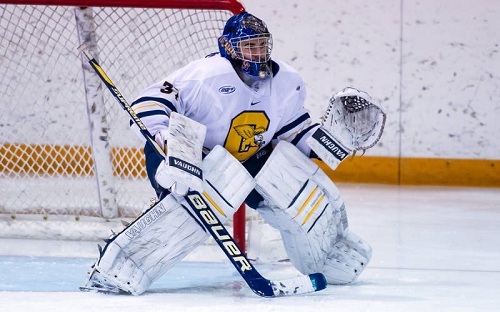 Goaltender Tony Capobianco was stellar in the sweep of Bentley, allowing 1 goal as Canisius won 4-0 and 2-1. He saved 70 of 71 shots face during the weekend. At this point, I am thinking that they would win the league title, but still not many people would give them credit. Next at hand was traveling to Colorado to face Air Force. Now, talking to players both past and present, it is not easy traveling to the other side of the country and playing at a higher altitude. Junior Kyle Gibbons scored the game winner with 9 seconds left in the first game to lead Canisius to a 4-3 victory. In the second game, Duncan McKellar scored 68 seconds into overtime to win 4-3 and sweep Air Force. At the time, I was in Baltimore listening to the game, as soon as I heard that goal go in, I was super excited. In the conference semi-finals, the Griffs would play the 15th ranked team on the country in Niagara, who is also the biggest rival for Canisius. I knew the game would be tense as they always are when these 2 teams meet. I really wanted to win because a)I hate Niagara and b) a win would put us in the conference finals. The Griffs not only won 5-3 but they played an all-around good game. They killed off all of Niagara’s power-plays and went 1-3 with the man-advantage. I drove back up to Rochester the next day to watch the Conference Finals between Canisius and Mercyhurst. I was so nervous to watch this game! I knew there was a lot on the line and a loss would be devastating. The Griffs pulled away in the 3rd period scoring 3 goals and won the game 7-2! It was the first Atlantic Hockey Championship in team history! We would be going to the NCAA Tournament. I vowed that I would go wherever the Griffs would play. Providence, Rhode Island. Canisius was the #4 seed and would be playing Quinnipiac. I arrived and was very excited to be at the NCAA Tournament! Several other Canisius people had made their way down, along with a few ex-Ice Griffs as well. Quinnipiac would get on the board first and take a 1-0 lead. Quinnipiac was the faster team and outplayed the Griffs. Tony Capobianco was solid for the Griffs this season. The Griffs would charge out of the gate in the 2nd period. They responded with 2 goals (Stephen Farrell and Patrick Sullivan) to take a 2-1 lead after one. Kyle Gibbons would go on to score his 21st goal of the season to extend the lead to 3-1 with about 17 minutes left. Quinnipiac would go on to score the next 3 goals and win 4-3. So close, but Quinnipiac showed why they were the number 1 team in the nation. Before their first round loss, Canisius had an 8 game winning streak which was the longest in the nation. They finished with a penalty kill above 90%, which is quite effective. The Griffs return most of their scoring from this season as they will lose 4 seniors (Preston Shupe, Torrey Lindsay, Ben Parker, and Chris Barrera). The Griffs would finish with a 19-19-5 record. 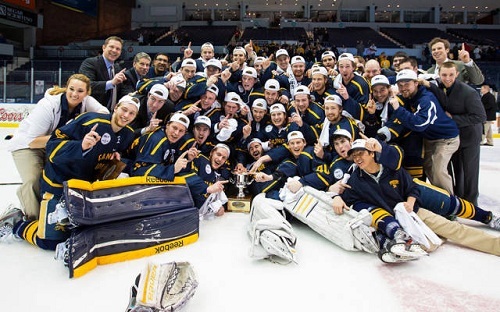 It was definitely an exciting last month to the season and Canisius has taken giant steps, showing they can compete with the top teams of college hockey. I couldn’t be more proud of this group of young, student-athletes who I know will be hungrier than ever next season. Look for Canisius to be a force in years to come as the culture and work-ethic is unmatched.